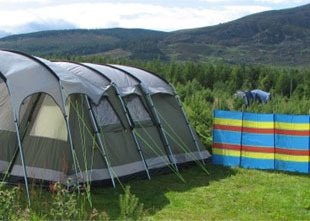 Pitches for tents of all sizes, Our tent area has pitches for up to 50 tents. Our tent area has pitches for up to 50 tents. As long as there’s space available, you can choose where on the field you’d like to camp. Or you can request one of our more secluded pitches within the pine trees. We have no areas of standing water on the park, which, apart from being safe for children, means we have few midges. As our tent field is in an elevated position it catches a slight breeze that also helps ward off midges. So we’re the ideal place if you love to camp out in the open and sleep under the stars. A footpath through pine trees takes you directly to the main facility block and play park. The roads are quiet and there’s plenty of space for children to play. Exactly what you need for a relaxed and happy family holiday. We have six large grass tent pitches with electric hook-up bordering the tent field. We have some large tent pitches that are bordered on three sides with pine trees. These pitches are sheltered and more private, so give you the feeling of a wild camp. We have a further eight large grass tent pitches with electric hook-up that are bordered on three sides with pine trees. The Old Quarry is an enclosed bowl, surrounded by trees. It’s a great space for very large tents or for groups camping together in several tents. It’s very popular with scouts, schools and expedition parties. There is no pitch fee as we charge per person per night. Glorious campsite and surroundings, saw red squirrels and doe on site in the morning! Clean, modern facilities. Would definitely recommend.